For a wedding invitation that offers style, class and elegance on every viewing, the Josephine Laser Cut wedding invitation is a class apart. This is a wedding invitation that evokes memories of traditional wedding and the most elaborate and elegant bridal gowns. The focus should always fall on the bride on the big day, and this invitation is exactly the sort of invitation that will set the tone, mood and scene for one of the happiest events of the year. The laser cut pouch comes with a diamante and pearl jewel with the pouch being offered in soft matt cream. The triple layered inserts add an additional touch of luxury, and although the RSVP postcard and additional guest information is optional, you will find that this is an invitation that delights every recipient. The Josephine Laser cut card is an elaborate and precious card, one that is ideally suited to a couple looking to create a sense of wonder and awe about their wedding occasion. Many couples prefer to focus on the traditional nature of marriage and the design and style of this invitation lends itself perfectly to the notion of a traditional and loving marriage. If you are looking to create a stylish and elegant tone for your special occasion, you want to start as early as possible, and the nature, feel and appearance of this wedding invitation will make this an easy task. 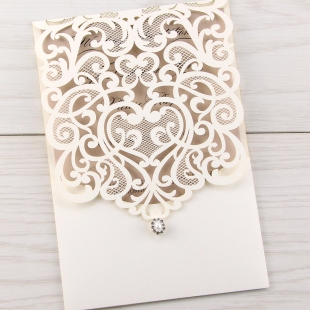 The Josephine laser cut is one of the most aesthetically pleasing wedding invitations you are likely to find, making it the most obvious choice for any bride and groom who want to impress their guests. Order from Pure Invitation. Tags: Elegant, Ivory, Pearl, Sophisticated.